Fall is here and the pumpkins are ready! Below is a list (and an interactive map!) of eight pumpkin patches in and around Boulder to visit this season. Each one has its own unique pumpkin assortment and fall festival activities! Scroll down for all the details. Anderson Farms is located at 6728 County Rd 3 1/4, Erie, CO 80516. The Fall Festival runs from September 19 – October 31, 2018. Pricing: Admission to Fall Festival – Monday – Thursday, $12, Friday, Saturday & Sunday $18. Kids 3 & Under are FREE. Tickets available here. Zombie Paintball Hunt or Terror in the Corn Haunted Hayride and Maze (Includes Fall Festival admission) $27 ($49 for both events). Tickets available here. Group discounts available. Anderson Farms is hosting its annual Fall Festival, complete with a pumpkin patch, hayrides and so much more! Admission includes a ton of fun activities such as Colorado’s longest-running 30-acre corn maze, hayride to the pumpkin patch, pumpkin launching, mine cars, barrel train, farm animals, farm lights and so much more. New this year: giant jump pads and a combine “playground” with six slides! Click here for a full list of activities. For those who enjoy a fright, after dark Anderson Farms hosts Zombie Paintball Hunt, a unique paintball experience where you shoot zombies throughout the cornfield (but don’t worry, you won’t get shot!) while riding on a zombie wagon. Or check out Terror in the Corn, Anderson Farms’ haunted hayride, cornfield & ghost town experience. Cottonwood Farm is now located at the SW corner of Isabelle Road & Highway 287. The Pumpkin Patch & Fall Festival runs from September 22 – October 31, 2018. Pricing: FREE Admission weekdays, $5 Admission Weekends. Children 5 & Under and Seniors 65+ always FREE. Wagon Hayrides (Saturdays and Sundays) $3/person (Children 3 & under ride FREE with parents). Cottonwood Farm hosts a classic Pumpkin Patch and Fall Festival in East Boulder. The farm offers a pumpkin patch as well as fall produce for purchase. Explore the hand-cut corn maze, with narrow paths for a fun and personal experience. The farm also offers a straw bale maze, farm animals to view, and vintage farm equipment display! Don’t miss the hayride, available on Saturdays and Sundays for $3/person. Miller Farms is located at 13912 Co Rd 19, Platteville, CO 80651. The Fall Harvest Festival runs from Labor Day to Mid-November. Pricing: Admission $22/adult, $15/kid, 3 & Under are FREE, Family of 4 $75, additional family members $18. Miller Farms hosts its annual Fall Harvest Festival every day throughout the fall season. Admission includes the farm’s petting zoo, harvest rides, corn maze and the Antique Alley, a collection of antique airplanes, trucks and tractors. Pick your own pumpkins and fall produce (fill a wagon for $35!). The farm offers snacks, drinks, and treats, and has dozens of covered picnic tables. Pack a lunch and spend a day at the farm! Munson Farm is located at 7355 Valmont Rd, Boulder, CO 80301. The pumpkin patch runs through November 1. Hayrides begin September 28, 2018. Pricing: Free Admission. Hayrides $5/person, $10/family. Munson Farm is hosting its annual Pumpkin Patch at its farmstand in East Boulder. Activities include hayrides, a corn maze as well as a pumpkin patch. 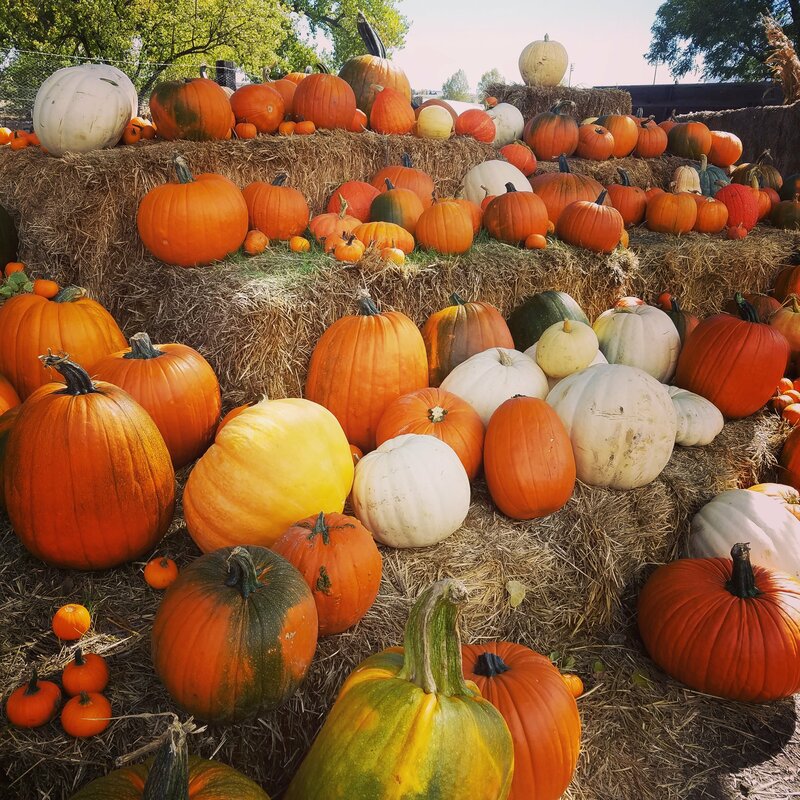 Munson Farm is known for its amazing selection of unique heirloom pumpkins including Cinderella pumpkins, pink pumpkins, and many more! Red Wagon Farm is located at 7694 N 63rd St, Longmont, CO 80503. The pumpkin patch runs early October through Halloween. Red Wagon Farm is offering a pumpkin patch at its farm in Longmont. Spend some time wandering the beautiful pumpkin patch to find your perfect pumpkin, see the farm animals including alpacas, llamas, goats, chickens and geese, and play in the straw bale maze! Rock Creek Farm is located at 2005 S 112th St, Broomfield, CO 80020. The Pumpkin Patch and Corn Maze runs September 29 – October 31, 2018. Pricing: Free Admission. Corn Maze $6/Kids Ages 4-11, $9/Person 12 & Up, Kids under 4 are FREE. Rock Creek Farm hosts its annual U-Pick-Em Pumpkin Patch and Corn Maze in Broomfield. Free admission includes access to family fun play area, hay bale maze, farm animals and comic foregrounds for photos. Tour the farm’s 120 acre pumpkin patch, with its beautiful mountain backdrop to find and pick your very own pumpkin. The farm also offers four different corn mazes ranging from .3 miles to 5 miles (pricing above). Rocky Mountain Pumpkin Ranch is located at 9059 Ute Hwy, Longmont, CO 80503. The October Pumpkin Carnival & Pumpkin Patch runs October 1 – October 31, 2018. Hours: Pumpkin Carnival every weekend, 9AM – 6PM, Pumpkin Patch & activities open weekdays, 9AM – 5:30PM. Pricing: Free Admission. Weekend activities are pay per activity, tickets $1/each (each activity varies from 1-5 tickets/child). Weekday self-guided tours & activities $8/child. Rocky Mountain Pumpkin Ranch is hosting its annual October Pumpkin Carnival in Longmont. The weekend pumpkin carnival features a kids corner, pumpkin patch, food vendors as well as activities (prices vary) such as: pony rides, carousel rides, painting pumpkins, petting zoo, hay maze, bouncy castle and so much more! Weekdays, the pumpkin patch is open to the public, with self-guided activities available such as: pumpkin painting, inflatable obstacle course, hay maze, and viewing zoo. 7th Generation Farm is located at 100 S 96th Street, Louisville, CO 80027. The Pumpkin Patch runs from September 29 – October 31. Pricing: Free Admission. Corn Maze $12/person. The 7th Generation Farm is celebrating Fall with a pumpkin patch & fall activities in Louisville. Activities included in admission: hay bale maze, huge hay bale mountain for climbing, pumpkin smash games, pumpkin painting station, farm animals, hayrides and so much more! The farm also offers a short, kid-friendly corn maze, as well as a large adult maze that takes about 1 hour – 1.5 hours to walk through (prices listed above). Take a hayride to the farm’s pumpkin patch to find your perfect pumpkin!